Rick Soriano | Anna & the Consequences… because there always are! A freelance drummer and keyboardist, Rick has been performing for over 25 years in groups playing jazz, blues, Latin, big band, funk, pop, rock, classical, musical theater, gospel, orchestras, and solo piano. He may perform on keyboards or drums depending on the show. 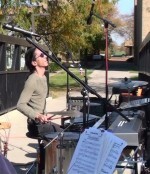 Or even drums & keyboards at the same time – you gotta see it to believe it! “Marching to the beat of a different drummer,” Rick brings in varied musical textures with his unique multitasking performance on drums and keyboards!